Jan. 1, 2019. 00:00 a.m. Most high and noble Heavenly Parent! I bow in front of You in infinite gratitude, within the infinite grace of the 6th year of Cheon Il Guk. The new year of the pig that we are welcoming marks the 100th anniversary of the day, in March 1919, Christian democrats and students shouted in front of the world for Korean independence, and brings us closer to the unification of this nation. 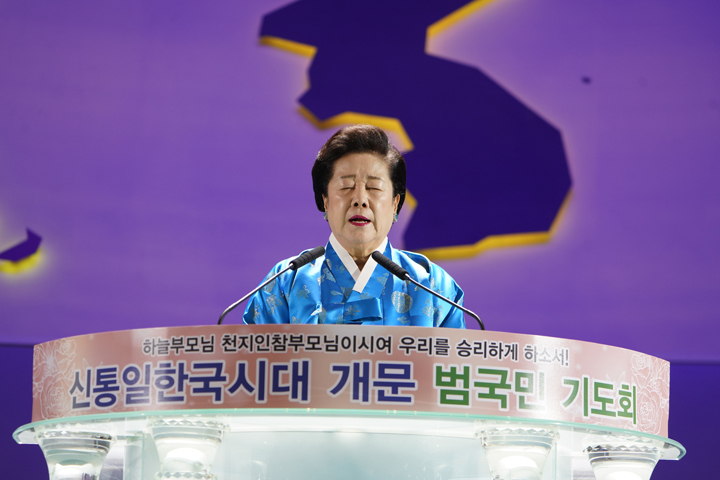 Though many righteous people and pioneers sincerely longed for the independence of this nation throughout its history, their devotion and effort could not prevent Korea from being divided into North and South. And we have come to the point where we see that political, religious, or human effort alone cannot undo this division. In particular, today, this people, whom You have since long ago embraced and raised until now to bring about the completion of the providence, must know about the truth of that history. The unification of Korea, which we so longed for, cannot come about based on human effort alone. 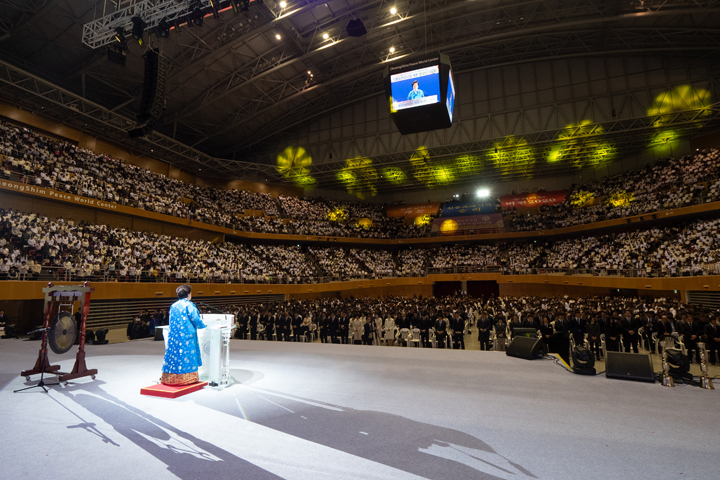 The true unification of Korea can only take place from a position in which we attend God, our Heavenly Parent, Creator and the Owner of this universe, and in which we have received the Blessing of the True Parents. I sincerely pray that humankind today will come to realize that the only way to establish the world with no war or conflict that all people have sought to realize, and the only way to bring down all man-made barriers, including the religious, cultural, and racial barriers, is through You, God, the true Owner of this universe and our Creator, and that without welcoming the perfected True Parents, who have come to realize Your wish and dream, in this fallen world, people cannot become Your sons and daughters. Through the past that You have shown us, please enable this people to understand that only when Korea is unified and fulfills its responsibility as a people blessed by Heaven, and becomes a heavenly unified Korea that attends Heavenly Parent, will this people have a future and have hope. With only one year left until 2020, the year in relation to which the 20,000 blessed families here today made their commitment before Heaven, I sincerely pray that this nation will become a central nation in front of the world that fulfills its responsibility as a people who know who the true Owner is, and as a blessed people who are citizens of Cheon Il Guk. Heavenly Parent! I offer You my sincere gratitude for the infinite love and grace You have showed this people, remaining with them amid numerous hardships and difficulties. This people now need to know. This people must not become a people that misses the time of the completion of the providence. Two thousand years ago, You sent Jesus Christ through the people of Israel, whom you had raised for 4,000 years. The people of Israel, however, did not know the essence of Jesus, and thus they paved the way for his tragic crucifixion. What happened to this people? They were dispersed and lived without a country for two thousand years. During World War II, 6 million were massacred. We all know about the history of indemnity they had to go through. This is the consequence that befalls a people that fails to welcome the True Parents of humankind, whom Heaven prepared to send through investing much effort over time. Heaven chose the Korean people and made preparations to send His only begotten daughter, who would complete the providence. Despite the hardships it was going through, this people continued to hold on to You, our God in Heaven. You know the pain of a people without a nation. At a time when democracy in South Korea stood helpless as the Korean War raged, we saw a miracle of God in the sending of the UN forces and the protection of democracy. Just as You gave all people a period of growth in accordance with Your principles of creation, You protected me, Your only begotten daughter, until I reached adulthood. As a result, in 1960, we could take our position as the True Parents. Without the Christian foundation to support us, True Parents had to start from the very bottom. And I thank You from the bottom of my heart for Your work and for the infinite protection you provided us during the ensuing 50 years until we could establish a foundation across the world. Since Your Will must be accomplished without fail, the True Parents, who have borne that responsibility, have invested their everything for that until now. As we will usher in the final year of the Chinese 60-year calendar cycle (cycle of ten heavenly trunks and twelve earthly branches) and prepare to begin a whole new cycle with the year of the rat in 2020, this people must accept Heaven’s Blessing, build a nation that fulfills its responsibility, and build a nation of whom Heavenly Parent can proudly say, “Truly, this is my homeland where my beloved sons and daughters live.” As the people that Heavenly Parent is to work through and a nation that is to become Heaven’s homeland, all the blessed families that have gathered here today should completely invest themselves in educating its people so that our country can stand strong as God’s homeland in front of the world as God desires. When all people in this nation, without exception, receive the Blessing and Heavenly Parent can wholly embrace our country, what will there be to worry about? I sincerely pray that all blessed families will become proud blessed families of the Unificationist community that, through this people, can show the world the realization of the dream of one great family under Heavenly Parent, a dream that this people and the world have longed to see come true. O Heavenly Parent! Though this people remains inadequate in front of Your tremendous and infinite grace, I pray and proclaim in front of You, Heavenly Parent, and in front of this people and world, that Korea will do its best to accomplish Your dream without fail. Aju!